Recently a few Colorado residents had their turn in front of Judge Judy to settle disputes relating to furniture. In one case, a nanny was moving into an apartment with a less than desirable roommate. After moving in some of her furniture she decided this wasn’t going to be a good match. On her way out, her dresser was damaged by the would-be roommate. In other case, a Boulder couple broke off their engagement and now wanted to split up the furniture they shared. In both cases, Judy Judy rule for the plaintiff. Damages were paid and furniture was restored. It’s all a perfect example of how much value we put on some of our furniture. There are sofas, chairs, tables and bedroom sets that we’re happy to hold onto and even fight for them in court. For everything else, there is Junk King Denver. Junk King are the expert junk haulers who won’t have any issues with taking away your old furniture. If you recall, it took at least two movers and their truck to bring in the sofa. That means you’ll need that same level of effort to get rid of it. Every Junk King removal appointment comes with a big truck and two very capable movers. These are movers who have been properly trained how to navigate around corners and stairs. That matters a lot when you’re moving out heavy objects. It might be that the furniture you’re getting rid of isn’t worn out or broken; you’re just replacing it all. In that case, Junk King will drop that furniture off at a reputable charity that specializes in refurbishing. Your furniture won’t be going to waste and that’s a good thing especially for a family in need that can benefit from those pieces. 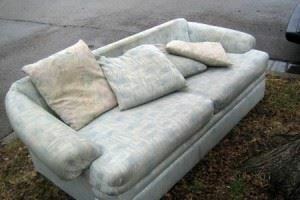 After the Junk King crew loads up your unwanted furniture they can do the same with anything else you want to toss out. This would be a perfect chance to finally toss out those outdate computers, printers and fax machines. You can also clean up the clutter in your backyard. Yes, Junk King will even remove debris left behind from the last storm. You could load a truck with a sofa, boxes of magazines, a stove, tree branches and an old lawnmower. Sounds like a typical pickup for Junk King Denver! When you’re ready to schedule your junk removal appointment Junk King Denver will be standing by. It’s very common to have same-day appointments. In other words, as soon as you know what you want taken away Junk King can get the job done! This entry was posted in Boulder Furniture Disposal, Boulder Junk Removal, Denver Furniture Removal, Denver Junk Removal Price, Junk King Denver and tagged Boulder Furniture Disposal, Boulder Furniture Removal, Denver Furniture Removal on August 28, 2013 by Paul Durant. Last updated August 1, 2017 . The race is on to cleanup four Windsor Middle Schools before school opens. Those schools suffered flood damage in the recent storm that raced through the area. Although the idea of school being delayed might come as welcome news to the kids, parents are eager to make sure the schools open on time! Teachers have reported to work but instead of preparing class assignments they are scrambling to make sure everything gets dry. This is definitely a “all hands on deck” type of cleanup emergency. Did you suffer any storm damage over the summer? If so then you should consider calling up Junk King Denver to help with your cleanout project. These are the professional junk haulers who can make sure any soggy item is taken from your home ASAP! Recovering from storm damage isn’t fun for anyone. Any amount of water that seeped into your basement could cause some serious problems down the line. The last thing you want is for mold or mildew to take hold. That’s why you’ll need to throw out anything that has become waterlogged and can’t dry properly. That includes furniture, clothing, carpeting and drapes. Here is where Junk King will be a big help. Their hard working crews will be able to lift and load all that damaged property. That same Junk King crew can also clean up any debris that has fallen in your yard as a result of the storm. Fallen tree limbs, roof shingles and anything else that needs to be removed can be carted off by Junk King. Of course, you don’t have to wait for a storm before you hire Junk King. They are happy to show up any time of the year to help you get rid of all your unwanted junk. Take advantage of them to finally clean out your garage or attic. How much can you throw away? You’ll have a huge truck to fill up so the answer to that question is up to you. Whether you’re getting rid of mattresses, lawnmowers, BBQ grills or sofas the Junk King crew will be happy to take it off your hands. Because Junk King is the most popular junk removal service in Denver, there is always a truck making the rounds. That’s why you could find yourself calling for a removal appointment in the morning and having your junk gone by lunchtime. Junk King Denver knows how valuable your time is and they’re not going to keep you waiting. When you’re ready to get rid of your junk, Junk King will be ready for you! This entry was posted in Denver foreclosures, Denver Junk Removal, Junk King Denver and tagged Denver Clean Outs, Denver Cleanouts on August 23, 2013 by Paul Durant. Last updated August 1, 2017 .